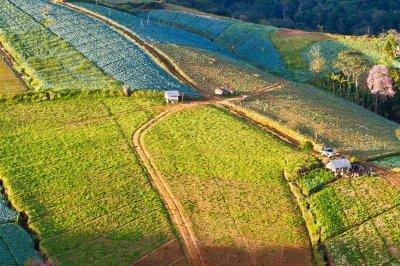 biotechnology – One Billion Hungry: Can We Feed the World? 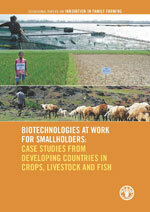 The UN Food and Agriculture Organisation recently released a new publication, Biotechnologies at Work for Smallholders: Case Studies from Developing Countries in Crops, Livestock and Fish, which details how biotechnologies can help smallholders improve their livelihoods and food security. The report urges governments and stakeholders to take greater steps to bring agricultural biotechnologies to smallholder producers in developing countries. Through 19 case studies in crops, livestock and fisheries, authors explore real experiences of smallholders using biotechnology in the production of a variety of crops, for example, bananas, cassava, rice, livestock and shrimp. The cases also cover a range of biotechnologies such as artificial insemination, fermentation and more sophisticated DNA-based methodologies, although not genetic modification. The case studies have been selected from India, China, Argentina, Bangladesh, Brazil, Cameroon, Colombia, Cuba, Ghana, Nigeria, South Africa, Sri Lanka, Tanzania and Thailand. In India, as an example, DNA markers have been used to develop a flood-tolerant rice variety with a potential yield increase of 1 to 3 tons per hectare compared to other varieties, under flood conditions. As of 2012, the new variety, Swarna-Sub1, was being used by three million farmers. In Cameroon, DNA-based diagnostic tools have allowed for the quick detection and diagnosis of Peste des Petits Ruminants outbreaks, a virus which can rapidly spread amongst goats and sheep. This biotechnology has enabled authorities to control the disease, thus preventing an outbreak. Pesticides, substances designed to prevent, destroy or mitigate any pest, are beneficial in many ways. They protect crops from infestation, allowing for higher and more stable yields, and they protect humans from insect attack, crucial in the fight against insect-transmitted diseases such as malaria. But they also pose serious threats to the environment and to human health. In response to the concerns over the impact of pesticides on bee populations, for example, the European Union, earlier this year, issued a partial ban on neonicotinoids. A new special issue of Science, The Pesticide Paradox, through a series of papers, explores the benefits and impacts of pesticides and discusses what more can be done to track pesticide use, reduce our reliance and its impact, and find alternatives. Understanding how and where pesticides are used and what hazards they pose is the first step to minimising their impact. For example, pesticide degradation and its effect on the landscape is little understood, as are the impacts of pesticides on non-target organisms and communities, and on human health and development. One paper shows the alarming impact exposure to pesticides in early life can have on brain development – reducing IQ and causing ADHD-like behavioural problems. Verger and Boobis in their article, Reevaluate Pesticides for Food Security and Safety, discuss the use and sale of generic versions of pesticides, which account for some 30% of total pesticide sales. As the original producer has little impetus to assess the usage and hazards, these pesticides, despite being more affordable to farmers in developing countries, may not meet internationally accepted criteria. Authors describe how these generic pesticides can be monitored. Food security, poverty reduction, environmental protection: increasingly the links between these three global challenges are being recognised. And a recent special feature of PNAS, Agricultural Innovation to Protect the Environment, explored this topic. As the introductory paper by Sayer and Cassman explains, agriculture is increasingly being required to consider its environmental impact along with ways it can increase natural capital. In part this is because an unhealthy environment can limit our ability to produce food but also because the intensification of food production we require to meet future food needs could have irreversible impacts on water resources, the climate and human health. 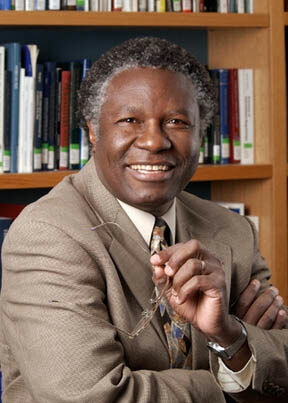 Innovation and innovativeness are needed if we are to tackle these interacting challenges. In the past the Green Revolution allowed food production to keep pace with population growth and is estimated to have saved 17.9 and 26.7 million hectares of land but it failed to address issues of sustainability and equitability, and the problems we face now are more complex.